Last weekend I played paintball for the first time in about 10 years. I forgot how much I love this sport. I can’t believe I ever stopped playing. 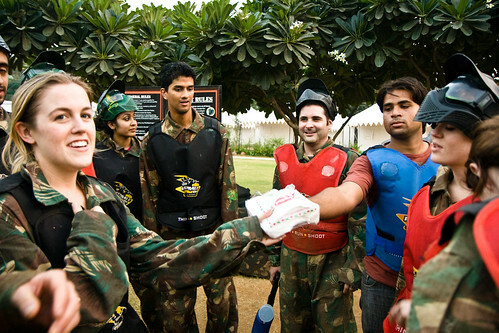 10 of us joined Denise to celebrate her birthday at The Paintball Company’s permanent speedball field at the Best Western Resort and Country Club in Haryana. It was a hell of a drive to get there, and there are closer places to play in Gurgaon, but it was well worth it. The action was fast-paced and we all had a lot of fun. 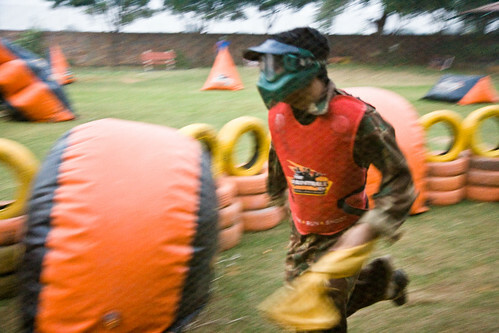 The only downside, because I’m a stickler, is that the equipment was a bit underwhelming and the paintballs weren’t very accurate. Maybe I’ll have to buy a paintball gun and bring it back from the states! On Taeber’s last weekend we headed on a road trip down to Jaipur to see some more of India. 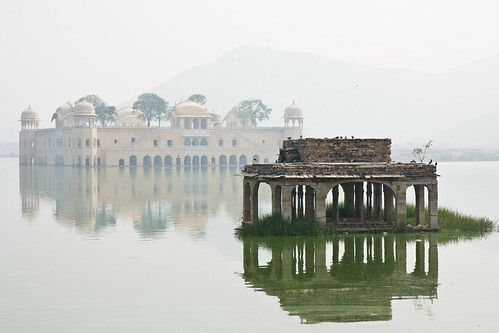 I have never been to Jaipur, but it turned out to be one of my favorite places. After a 6 hour drive (I was driving) including stops at places like McDonald’s and Cafe Coffee Day, we arrived and attempted to quickly locate a hotel for the night. After calling some friends we ended up staying at Hotel Arya Niwas. We had a bit of trouble finding it, mostly because I was relying on Google Maps for my Blackberry (search results are a little whack in India). Once we found it, everything turned out to be really great! Not only were the rooms reasonably priced, but the food from the restaurant (a mix of Indian and Continental) was fantastic! The three of us watched a few episodes of It’s Always Sunny In Philadelphia before heading off to sleep. The next morning we took a half-day government-run city tour. We saw a lot of nice forts and even got a bit lost in one of them, racing against the clock to return to our tour group waiting for us in the parking lot. I hear we missed out on some of the cooler things in Jaipur that are only on the full day tour, but I’m fine with saving stuff for next time. The Jantar Mantar observatory more than made up for it! 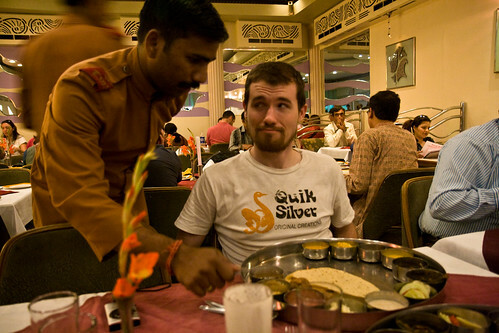 We ended the day with some Rajasthani Thali at Hotel LMB’s restaurant. The serving staff was very friendly and explained every dish to us. 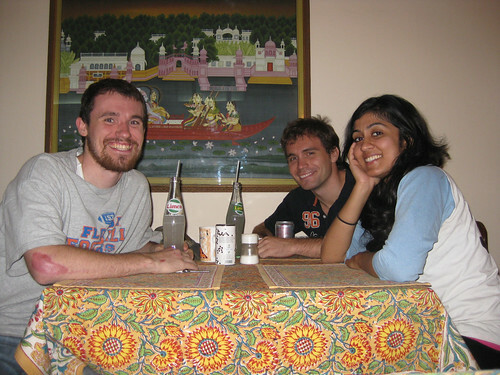 Thanks to Nicole, Taeber and I experienced some new Indian food that we liked a lot. I have already had a second serving since I have been back in Delhi. We would have loved to stay longer but it was already getting late and we had a long drive ahead of us back to Noida. Entertained by USB sticks full of Taeber’s music and Nicole’s road games, everything went smoothly. Except for the part where we dashed across the highway and I nearly twisted my ankle on the metal railing and fell into the gutter in an effort to get to Cafe Coffee Day. That wasn’t so smooth. 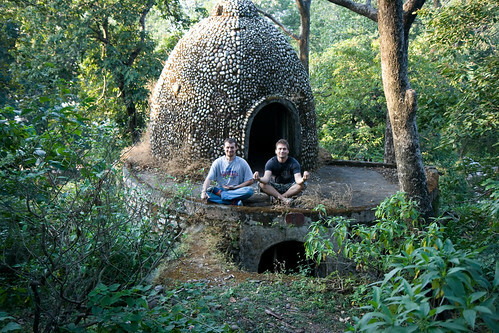 This weekend Taeber and I went up to Rishikesh and Shivpuri to get out of Delhi for a few days. The air was clean and fresh, the water amazing, and we were a bit surprised by the fun we had. We went rafting and even explored the Beatles’ ashram (which I wasn’t able to find on my last trip). Thanks, BlackBerry GPS with Google Maps! Taeber has all of the rafting pics on his camera. We’ll get them posted soon!